Hardback. New. Dio Cassius (Cassius Dio), c. 150 235 CE, was born in Bithynia. Little of his Roman History survives, but missing portions are partly supplied from elsewhere and there are many excerpts. 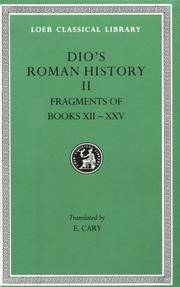 Dio s work is a vital source for the last years of the Roman republic and the first four Roman emperors.